Mimicking a leaf, a katydid stays quiet and still in daytime to hide from hungry birds. It has very long antennae, large back legs for jumping, and wings held like a tent or peaked roof over its back. When you hear the chorus of insects on a late-summer evening, you probably recognize the katydid songs quite easily, and kids have fun listening to them. But would you know a katydid if you saw one? Katydids (family Tettigoniidae) aren’t easy to see, mainly because they’re active at night, starting as darkness falls. These singers live in trees and bushes, and they stay still during the day – for their own protection from daytime predators such as birds. Katydids in our area are typically bright green, or sometimes tan, all the better to camouflage themselves among the leaves. They’re one to five inches long, depending on the species. 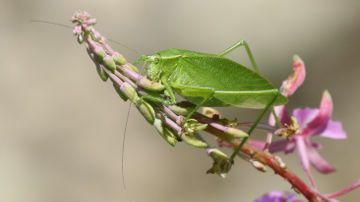 If you come across a katydid during the day – in your garden or yard, or in the vegetation along a road or trail – you might think you’ve found a grasshopper. Like grasshoppers, katydids have obvious, large back legs, specialized for jumping. Adult katydids have wings, but they are weak flyers. At rest, they hold their long wings over their bodies like a tent or peaked roof. They actually have four wings, but you’ll only see the front pair. The thin back pair lies folded up like a fan under the thicker front pair. How do katydids make their distinctive songs? They rub their front wings together, moving a scraper on one wing against ridges on the other. Not surprisingly, their “katy-did” song has a mechanical, raspy sound. As you may have noticed, the warmer the night, the faster their song. The same goes for other insects in the summer evening chorus, such as crickets. Why does this happen? Insects are “cold-blooded,” meaning not that they’re always cold, but rather, that their body temperature matches the temperature of their surroundings. The warmer they are, the faster their body processes work, and the more quickly and easily they can move and make sounds. You’ve probably already guessed the point of the song. The males sing to attract females, and perhaps also to keep other males away. In some cases the females may respond with a sound, but a softer one. Each species of katydid has its own song, which other members of the same species recognize. How many species are in our area? The recently published regional field guide, Insects of New England and New York by Tom Murray, shows photos of 8 different species of katydid – check it out. How do katydids hear? Don’t look for ears on their heads. They’re on their front legs. Their “ear” (called a tympanum) is a round membrane that vibrates with sound, much as our eardrum does. Nerves attached to it are stimulated by the movements. What do katydids eat? They’re mainly vegetarians, eating plants. Their mouth parts are specialized for chewing. Fortunately, katydids in our area are generally not numerous enough to damage our plants. Katydids themselves are food for many creatures. Besides birds (such as robins, cardinals, blue jays, bluebirds, nuthatches, crows, flycatchers, hawks, and owls), their predators include bats, garter snakes, toads, spiders, tiger beetles, hornets, and praying mantises. Worldwide there are about 6,000 species of katydid, mostly in the tropics. North American has about 255 species. While the season lasts, enjoy the exuberance of the insect chorus and the katydids’ songs of summer.